FIRST HOUR FREE OF CHARGE! There are some chores that sit on your to-do list forever. We keep putting them off because, honestly, how many of us want to spend our Saturday afternoon scrubbing the inside of the oven? Or dusting cupboard shelves? At Helpling, we definitely think life is too short to spend it cleaning the forgotten corners of your home. Discuss with your cleaner how you want to spend the booked hours. Helpling is an online platform that enables customers to find and book premium cleaning services in Singapore. With Helpling, you can book a professional cleaning service in less than a minute, freeing up your time for the more important things in life. Simply tell us about your home so we can find a Singapore cleaner that fits your requirements, choose a time and date, then sit back and relax. Our cleaning partners are thoroughly vetted and background checked, in order to guarantee your cleaning is carried out to a professional-level. Helping provides access to vetted cleaning services to thousands of homes across Singapore. Our customers choose Helpling for the quality of the home cleaning provided by our partners, but also for our convenient booking system. With Helpling, you are only ever a few clicks away from a sparklingly clean home. Our customer website allows you to manage your bookings and payments easily. Home cleaning services are competitively priced at $20 per hour for regular bookings and $30 per hour for a one off home cleaning. Thanks to our transparent pricing model, you know exactly how much your order will cost upfront. No surprises! Our process for recruiting new cleaners is rigorous, and all our cleaning partners have passed an aptitude test, a face-to-face interview, as well as thorough background checks. All cleanings are backed by an insurance policy of up to $1 million, so in the (very unlikely) event that something goes wrong, your home and possessions are covered. The dedicated Helpling customer care team is available to answer your questions, or to solve any problems. You can contact us from 9am – 6pm, Monday through to Friday. Head over to our customer review page if you want to read first hand from our customers what they love about the Helpling cleaning services portal. You can add extra cleaning services on top of the standard cleaning package. Let a Helpling cleaning partner take care of the ironing, oven, closet, fridge, and spring cleaning, and the cleaning of interior windows. You can rest assured that our cleaning partners will do an professional-level job of whatever additional services you request. 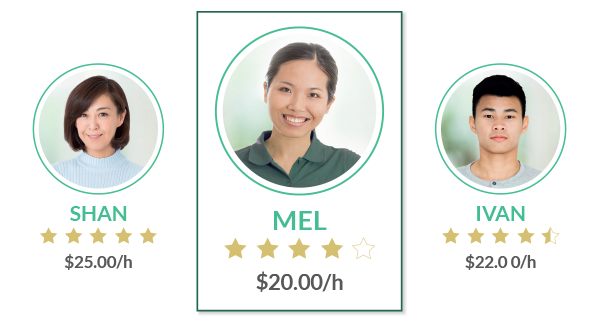 Additional services are provided at the same hourly rate, so you’ll know exactly what you’ll be paying before the clean. Choose your extra cleaning services during the booking process. So book a clean now and have your house sparkle from top to bottom, no effort required! We'll connect your with professionals who can take care of these specialised jobs for you. Our deep cleaning services cover all areas of your home thoroughly, while external window cleaning will leave your windows shining and your home or office full of light. Commercial or office cleaning can be booked on a regular basis and comes with our Helpling guarantee of service. Find our more and get a quote for one of these services here.